Birds in the House is a new media and video production company based in Vancouver, BC, Canada. Creativity is our passion. We're thinking out-of-the-box, engaging rather than slick. We focus on storytelling that brings people together, forms a stronger community, and inspires. Birds in the House Productions has a keen interest in illuminating the thoughts and realities of the marginalized and less vocal, as well as highlighting environmental, culinary, and cultural features of communities. Well versed in new media, Geoff Peters is a major local contributor to Youtube, with his channel geoffmobile having over 1.5 million views. Geoff has interests in software development, music production, jazz piano, food, virtual reality, photography, human rights, comedy, fiction, and satire. In addition to completing a B.Sc. in Computing Science from SFU, Geoff Peters studied digital video production, film studies, and music production at Langara College in Vancouver BC Canada. Geoff was the videography sponsor for the Food Talks series of events hosted by Vancouver Foodster, featuring discussions from experts on food security / sustainability, ethnic foods, creative cooking, and local farming in Vancouver Canada. Geoff also volunteered as a videographer for the frank theatre company, "a Vancouver-based professional theatre company whose vision is a world where sexual and gender diversity is embraced by everyone." In 2012, Geoff's film "A Different Beat" was shown at Cannes Short Film Corner in France, which he wrote and directed. Geoff and his collaborators also released a 13 minute comedy short called Shawarma, filmed on location in Vancouver. 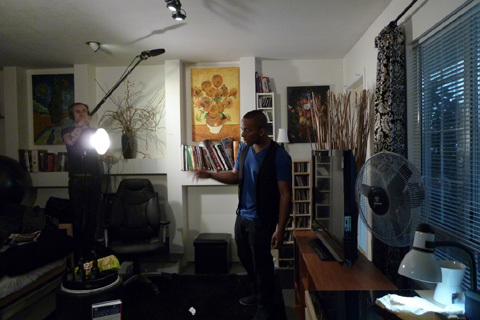 In 2011, Geoff was a top ten finalist in the Nokia Direct and Project competition held at the Vancouver Art Gallery, with his short film "Alphabetical Order in my Neighborhood". Most recently Geoff has discovered a passion for virtual reality and 360 degree immersive filmmaking. Our recent work can be found on the features page. Birds in The House Productions has access to equipment and tools to enable creative freedom in video, music, and photography. Our comfortable studio space can accommodate music recording of small ensembles, live performances, music video shoots, and is complete with a fully stocked kitchen available for food photography and cooking video production. (above) Filming "Shawarma" on set in 2011. 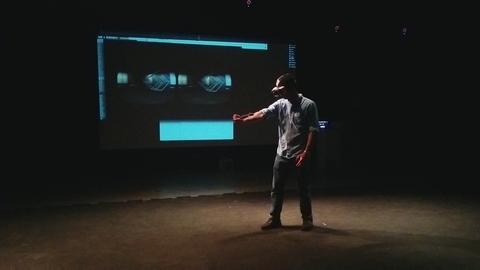 (above) Attending a demonstration of Virtual Reality technologies at Emily Carr University of Art + Design. Our studio is located in Yaletown, near Level Furnished Suites.